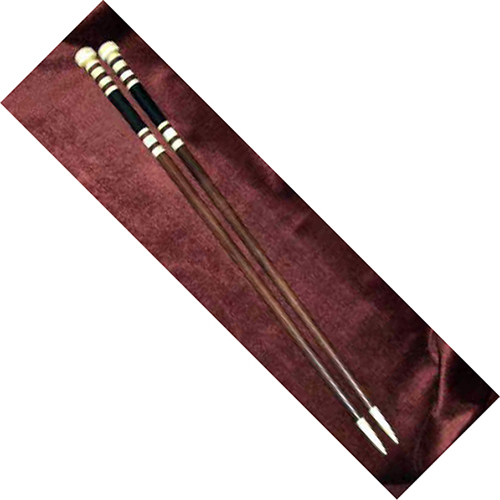 Presented here, a pair of Scrimshaw Knitting Needles made of Ivory and exotic woods . . . Rosewood and Ebony, I believe. The decorative ivory top kept the knitting from slipping off the needle When such a top exists, the needle was sometimes referred to as a Knitting Pin. A not commonly found but most useful item. As the loved one at home filled her lonely hours with her knitting she would think of the husband or lover who made the needles for her. Perhaps she was even knitting him a sweater or hat? Size is 14" long and the condition is high outstanding!